Originally released on April 10th 2006. Original version of this review posted on April 1st, 2007. Richard D. James last “Proper” album, the ambitious but inconsistent Druqks, was spoilt by lack of depth and a mischievous tendency to expose uninitiates to the opposite extremes of his canon, from languid tranquil ambience one moment to almost unlistenable ear-splitting drillcore the next. Defiantly obtuse, the Cornishman has pulled off the masterstroke of earning his dues in a notoriously factioned cabal whilst keeping his credibility and can now rightfully claim to be one of the granddaddies of the UK techno movement, enabling a sense of unfettered creativity akin on Druqks to Lou Reed’s contract busting White Noise. Whilst James claimed characteristically that the misfire was merely a bunch of unfinished demos culled from a stolen laptop, the continued re-issuing of neo-classic, hard to find archive material such as Hangable Auto Bulb that had sustained spotter obsessives in the interim only served to underline Drukqs inadequacies. Nothing to prove with new material? Perhaps. 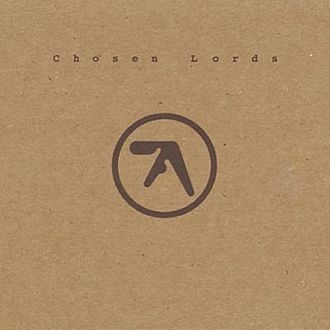 Culled from a number of EPs released under the Analords moniker and created using his proprietary analogue equipment (Undoubtedly made from pieces of the Smash robots or a second hand Tardis) Chosen Lords uses the template that made James’ early releases so vital, dispensing with industrial strength distortion and replacing it with a more pleasing to the ear post acid house aesthetic. Contrary as ever, the maverick sounded like his new resolution was not to take techno to new frontiers, consciously throwing off the mantle of experimentation like a chef making himself beans on toast. The reintroduction of these twisted melodics makes Chosen Lords his most accessible work in years and the bleeping euphoria of Pitcard, the acid warmth of Klopjob and the future/past tv theme Pwstealldpinch should be some recompense for the once bitten cynics who bought Drukqs expecting a return to the blissful Ambient Works era but found it like Chinese water torture. They may even plug their speakers back in. Still sounding unmistakably original, if Druqks proved that the left field vision was there but raised questions over the execution, Chosen Lords deftly illustrated that James knows he has an audience and very occasionally he likes to give them what they want.